Business owners and residents listen as the Port Authority presents its plans for an expanded Penn station. MIDTOWN — Concerned business owners set to be displaced by the Port Authority’s upcoming Penn Station expansion project demanded information from the agency and threatened to sue to stop the project on Wednesday during the first and only public hearing. Critics have accused the agency of withholding crucial information about one of the nation's largest transportation projects, the $8.7 billion Access to the Region's Core, which will bore two commuter tunnels under the Hudson River to Midtown and building a new station beside Penn Station. The agency was required to hold a public meeting under the terms of eminent domain law. No residents will be forced out by the project, but 93 businesses will be displaced, either fully or partially, and thousands will be affected by construction. Even partial evictions could last as long as 10 years, officials said. 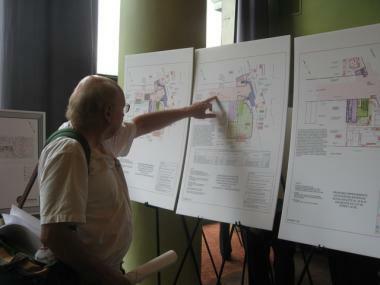 New Jersey resident Jim Raleigh, 76, who spoke out against the project at the hearing, examines the Port Authority's plans. "What happens to me?" Adam Gindi, the owner of Diamonds and Dials at 106 W. 34th Street, asked the panel, "I've spent the last year and a half looking for alternative locations, but there's nothing out there. This is devastating." Gindi, 46, told DNAinfo later that having to relocate from the store where his family has operated for half a century will put him out of business and added that he is planning to sue to try to stop the takeover. Howard Sackel, the director of the project for the Port Authority, told those assembled Wednesday that the Authority is "going to make every reasonable attempt to negotiate" with property owners before taking additional steps. But forcible takeover is not off the table, he said. 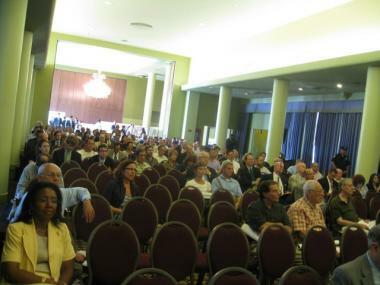 "If settlements cannot be reached, the Port Authority proposes to use eminent domain, which is the purpose of this meeting," Sackel told those assembled at the Hotel Pennsylvania. Joseph Clift, 60, speaking on behalf of the Regional Rail Working Group, accused the authority of demolishing buildings and taking land that it doesn't really need. "It’s not necessary," he said. "People who are going to be displaced should fight it." Others, however, touted the benefits of the project, which aims to double commuter capacity between New Jersey and midtown, create thousands of jobs and bring billions in revenue to the city, according the project's website. Thomas Wright, executive director of the Regional Plan Association, said that the city's transportation infrastructure is heavily stressed and that the project is crucial for its future. "It’s difficult to see how the region will grow without the expansion this project represents," Wright said. Construction has already begun on the New Jersey side of the tunnel and work is expected to begin in Manhattan later this year. The main work in midtown is slated to begin in late 2011, Sackel said. Critics have complained that the Port Authority has shared little information with those facing displacement as a result of the project, except through the press. Opponents also accuse the agency of failing to provide time lines for the construction or a breakdown of which parts of buildings will need to be evacuated, despite the fact that the plans are public. "All we can tell is that there's a temporary easement of unknown duration and unknown zones," said Jamie Dickinson, who spoke on behalf of the 152 W. 34th Street Realty Association. Dickinson blamed the agency with trying to get a "permanent carte blanche veto power over our development rights." Several affected business owners also requested alterations to the plans, including switching certain buildings from one side of the street or one side of a site to the other to limit the impact on residents and businesses. The Port Authority will accept comments in writing until 5 p.m. on July 28.